These are surely shocking words to the ears of most yoga enthusiasts, who find the association of yoga with Satan to be both disturbing and incongruous with their own understanding and experience of yoga. 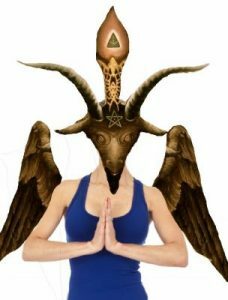 Yet, so begins an article announcing yoga classes to be held in the Satanic Temple of Salem, Massachusetts. How could something so widely considered beneficial in every way suddenly be associated with the devil? After all, yoga has achieved status in the West as the seemingly ubiquitous answer for the general well-being of just about everyone—from children in our public schools to the elderly in assisted living, from those with robust health in the prime of their lives to those with terminal illnesses nearing the end of their lives, and everyone in between. Many healthcare professionals recommend yoga for purported benefits such as the increased strength, flexibility and balance attributed to yoga’s postures; for the reduced blood pressure and heart rate attributed to yoga’s breathing techniques; and for the inner peace and global harmony attributed to yoga’s meditative spirituality. Yet, while most acclaim what they believe to be the positive benefits of yoga, William J. Broad, in his New York Times Magazine article How Yoga Can Wreck Your Body, warns that it can actually cause serious physical injuries such as trauma to the back, neck and head, as well as brain injuries and even stroke. But as Christians, we also need to ask whether there could be real spiritual dangers associated with the practice of yoga. We need to understand what the essence of yoga really is.